Backwater Guide Service offers this fun and exciting shelling trip across the Apalachicola Bay to Little St. George and St. Vincent Wildlife Refuge Island. These two majestic barrier islands are undeveloped and are protected by state and federal laws and regulations. 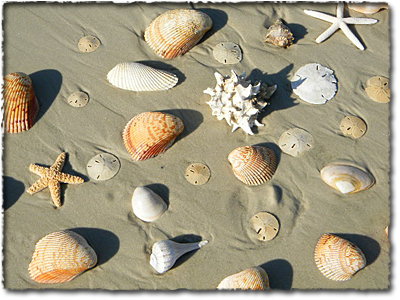 It’s along their shores on the gulf side is where you can pick up many different whole beautiful seashells and everyone’s favorite, sand dollars. Yours to keep for souvenirs, to make baskets, necklaces, etc. Fun for the whole family! Even for you, Dad. Hang out with the captain and fish while you have one eye on your family and the other on dinner at the end of your line. In fishing season, with the right conditions, it can be a family trip of a lifetime. 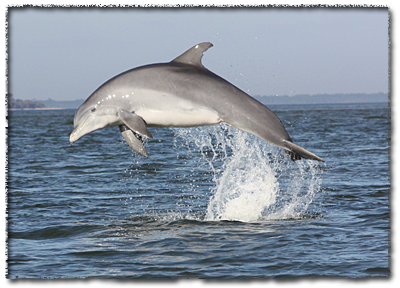 One of the highlights of the trip is encountering numerous pods of dolphins feeding and playing along the way. Be amazed how close you will be with the dolphins. They may even decide to ride along with the boat, jumping in and out of the boats wake. Also you can plan a picnic at one of the captains favorite secluded spots. Bring a watermelon or maybe a fresh bag of local caught oysters and the captain will be glad to shuck ’em for you. With the captains knowledge of where the hot spots are for shelling and fishing, you will leave looking forward in returning back the next time your family’s on vacation. Note: If vacationing for the week, plan this trip at beginning. If days are available the captain will pick calmest day for trip.